So I just got PCS’d to Rock Island Arsenal a few days ago and I just finished walking thru the museum. It’s a small museum but if you ever have a chance to walk thru it I recommend doing so. Despite its small size they have a lot of interesting variants and pieces, including the first ever 1903 to come off the line. Anyway, I walking thru the military rifles displayed and I come across a couple of 1903a4’s and one in particular caught my attention because it’s topped with a Weaver K4. As far as I was tracking no K4 scopes were ever used with a4 rifles. 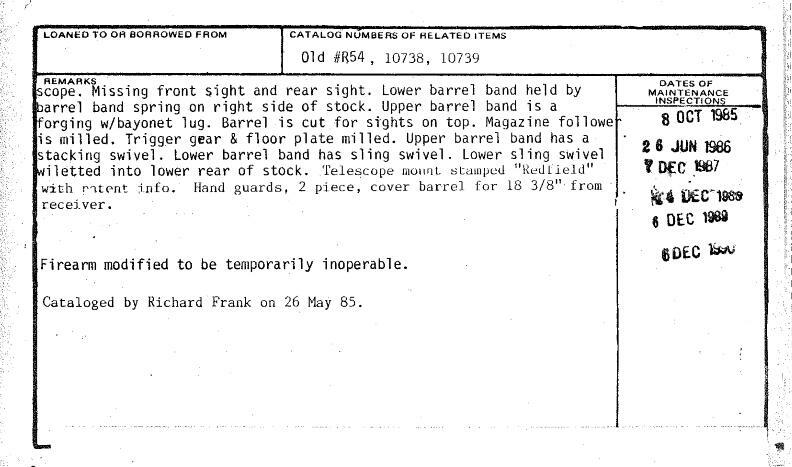 The museum has binders with the documents on each rifle and sure enough it’s cataloged as a 1943 built a4 with a K4. Probably means nothing since it was acquired in 1977 but I still found it interesting. I am by far an expert. 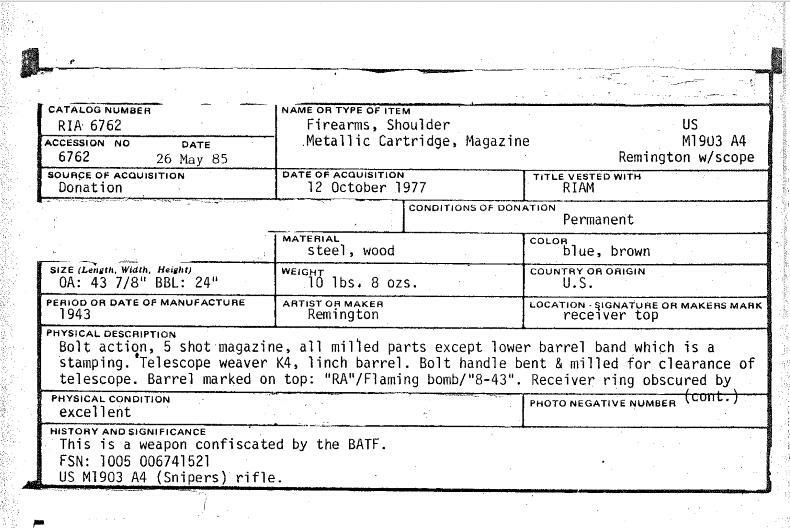 But, from what I have read, there are a lot of different stories about what scopes were put on those rifles. In the rush to get them in the field, who knows? There are legit A4's with Weaver K-4 scopes.......apparently assembled in the Vietnam era. The K series scopes didn't come along until 47, I believe the rumor goes that the FBI may have used that combination some time later. RIA has a lot of guns in the museum. However, the collection is very of hap-hazard. The guns came from all sorts of sources over the years and the museum apparently took and displayed everything that was offered. I don't think the fact that any given weapon is in a particular configuration in the museum means too much. The weapons are displayed as acquired and the fact that the rifle now has a K-4 scope probably does not mean anything other than someone mounted a K-4 scope on it at some point. I assisted in an inventory of the collection last year - the guns look much better from 20 feet away then they do on close inspection. all the weapons on display, have a number, in the card file room right behind were they are displayed are card files matching those numbers... you will find, one of those was donated by the CIA., the other by the FBI.. This sounds like the likely card associated with the rifle. A4 with K4 Scope. Unless there were others. I just pulled the first card that matched your description. It notes being confiscated but the BATF. Which actually explains a lot. This is the card chuckindenver was talking about. Interesting gunshow 7.62 NATO find. You find interesting NON-gun items at gunshows, too! !